Published June 29, 2015 – Surplus military Humvees heading to the highway? Hay is heading to the highway, so that you can’t find the needle in the haystack. What was once out of the norm, will be the norm. You’ll see these vehicles bc of the heightened military presence; but the real dangers will be hidden among us. It just got a little easier to take the ultimate off-roader onto the street. 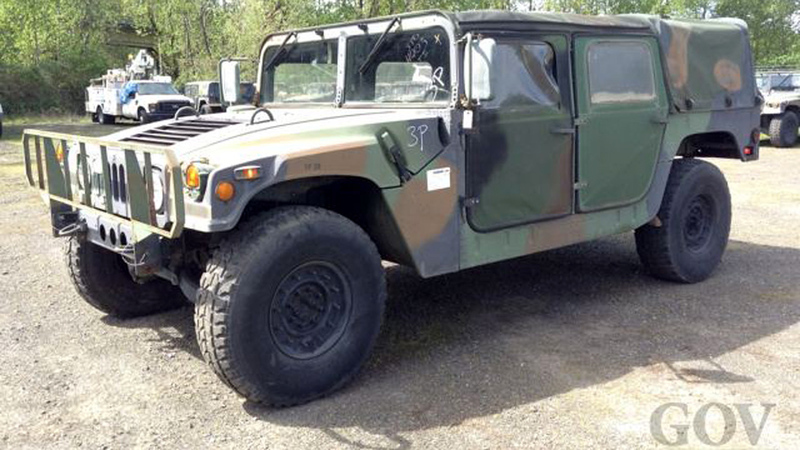 Last December, the Defense Logistics Agency began selling off surplus military Humvees to the public for the 1st time through auction site GovPlanet.com, which is operated by used heavy equipment sales outfit IronPlanet. Since then, over 1,100 have been purchased for prices as high as $41,000, w/the government pocketing 75.29% of the proceeds. And 1000s more are on the way. Their popularity has been stronger than expected despite the fact that the trucks were approved for off-road use only, making it exceedingly difficult to legalize them for street use. But now that’s changed. Moving forward, all of the Humvees sold through the auction will come w/GSA form SF97-1, which allows the buyer to obtain a title for their truck. This is the 1st step toward registering 1 for the road, & also makes it easier to insure & resell the vehicles. IronPlanet VP of operations Randy Berry says the forms will also be retroactively issued to all of the Humvees that have previously been sold, as well, & expects this to increase their resale value while leading to higher bids at future auctions. Of course, there’s more to making an ex-military machine street legal than simply getting it titled. Regulations vary state to state, but the biggest hurdle is often passing an emission test. That’s particularly true in California & the states that mimic its emission laws. Gale Banks has been helping the U.S. Military upgrade its Humvees for improved performance for years, so he knows a few things about their engines. His company, Banks Power, is already working on a kit for the surplus trucks that would swap in a brand new GM Duramax Diesel V8 & 6-speed transmission tuned to 420 hp & 900 lb-ft of torque that meets current emissions standards, but the real trick is bringing the original engines up to snuff. The problem, according to Banks, is that military vehicles don’t technically have model years, & are exempt from smog rules while they’re in service. So, unless a state recognizes a truck’s build date as the model year, there’s really no way to pin down its smog designation & suggest the required modifications to the stock motor. Given the # of vehicles on the way, he’s hopeful a solution can be found. In the meantime, the steady flow of demilitarized, un-armored & un-armed Humvees in troop & cargo carrying configurations cycling through GovPlanet.com continues. Interested customers need to clear a trade security background check to submit bids.